The seized items and apprehended person were later handed over to Harisinga police station, and a case (No. 50/18) was registered under section 25(1-B) of Arms Act. The weapons seized by SSB personnel. Photo credit: Northeast Now. 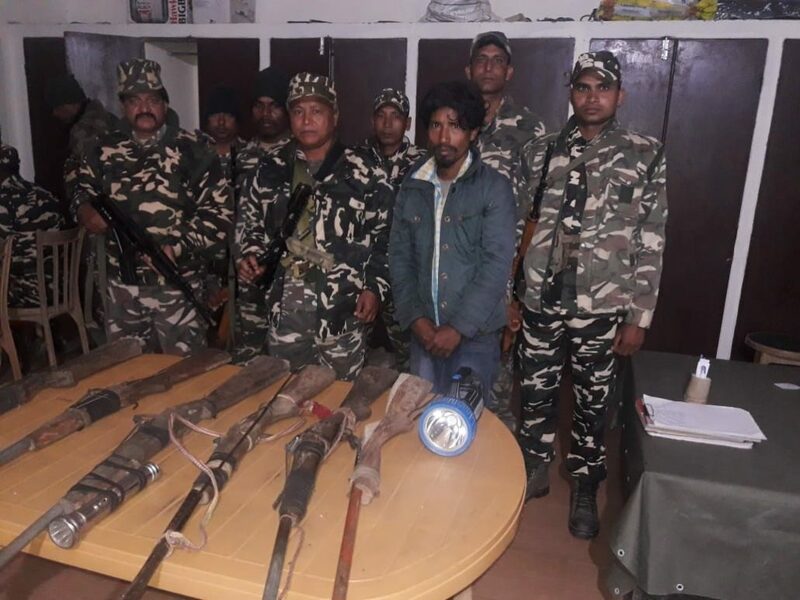 The troops of 37 Battalion of Shasastra Seema Bol (SSB) stationed at the border outpost at Deepabasti, seized six country made guns near Laxmi River on Wednesday night and apprehended one person namely Simson Ghatwar (25) S/o Jogeshwar Ghatwar hailing from Corramore Niche Line village under Harisinga PS in Udalguri district. The seized items and apprehended person were later handed over to Harisinga police station, and a case (No. 50/18) was registered under section 25(1-B) of Arms Act. The SSB is deployed in different parts of Assam along the Indo-Bhutan border, apart from guarding the border, have also been carrying out operations to prevent anti-social activities along the border areas.